As I shared last week, fall can be a great time to purchase a new home. Here is a look at more outstanding opportunities to buy in San Diego in the coming months, as well as a few last chances to buy in fantastic neighborhoods. Valencia Hills recently announced its Final Phase Release. Included in this release are three beautifully furnished and upgraded model homes now available for purchase. These three dynamic floor plans offer fresh, contemporary designs and traditional family-friendly lots ranging in size from about 1,634 to 2,447 square feet, with three to five bedrooms and two to three baths. They are priced from the mid-$400,000s to the $500,000s. 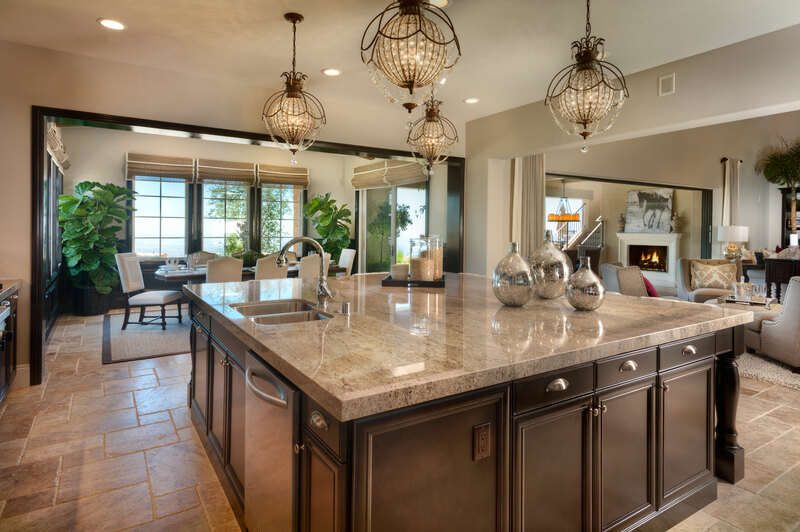 Family-size kitchens with granite countertops open into spacious dining and living areas. Designed to provide expansive living spaces, master bedroom suites, and interior laundry rooms with sinks, each home offers additional design options for buyers to add their own personal touches. Fully furnished models are located at Valencia Hills at 6915 Valencia Court, Lemon Grove (please enter from San Altos Place off Massachusetts Avenue). Visit Valencia-Hills.com or call (760) 585-4486 for more information. The sales office is open daily from 10 a.m. to 5 p.m. and Wednesdays from 1-5 p.m.
California West Communities’ 49 custom-inspired residences of Southern Preserve in La Costa, Carlsbad, overlook the rolling hills of Olivenhain, bordering a nature preserve and open spaces. A new phase of homes was released Oct. 10. Highlights include oversize backyards on select homesites, stunning views, a private cul-de-sac and covered outdoor living spaces. The homes at Southern Preserve, La Costa, showcase single- and two-story homes, providing up to six bedrooms and 6.5 baths, priced from the $1.2 millions. To learn more, visit SPLaCosta.com or call (760) 652-5426. California West Communities also proudly offers Upper Cielo, 41 custom-inspired residences at the top of Cielo. This exclusive community features spectacular luxury homes and custom home sites, occupying one of the highest vantage points along the San Diego coast and providing an unprecedented portal to sweeping views. Select move-in-ready homes are currently available for purchase. Highlights include large, stunning upgrades; select, unobstructed views; and plenty of room for personalization. The homes at Upper Cielo, Rancho Santa Fe, showcase up to five bedrooms and 5.5 baths, with prices starting in the high $1.2 millions. Upper Cielo is now open daily. For more information, call (858) 756-4321 or visit UpperCielo.com. Shea Homes has announced last call at Everly, located in El Cajon at Chase and Avocado Boulevard. Everly’s three- and four-bedroom plans are now priced from $489,000. Shea’s newest community, Serra on East Vista Way in the City of Vista, is now selling in its second phase, with a new release expected soon. Davidson Communities released its final phase at Arterro in Carlsbad, where large family homes are situated on home sites that offer spectacular views and cul-de-sac locations. Davidson’s other North County neighborhoods include Enclave Rancho Santa Fe, an intimate community of 13 new homes behind private gates with views of the golf course at the Crosby, and New Crest Court, a community of 16 new homes in the Carlsbad School District. Exciting things are happening at Taylor Morrison’s Seagrove in Carlsbad this fall as well. Not only are the models now open in this sought-after community, but a new phase is also being released. The modern, sleek design of the three-story townhomes, which offer rooftop decks with views of coastal San Diego and Carlsbad Village, is complemented by finely appointed details throughout the home. Within walking distance to the beach and to the charming shops and entertainment venues of Carlsbad Village, Seagrove provides an exciting lifestyle sure to be the envy of others. Visit Taylor Morrison’s Seagrove neighborhood at 2503 State St., Carlsbad, or call (760) 476-1341. Carlsbad, Calif. (September 8, 2015) – California West is one of San Diego’s most honored and time-tested homebuilders. This tradition of building highly personalized residences throughout the county is now showcased at two of the areas fastest selling and most popular communities: Southern Preserve, La Costa (www.SPLaCosta.com) and Upper Cielo, Rancho Santa Fe (www.UpperCielo.com). The two new collections of custom-inspired estates present the opportunity to co-create a highly personalized residence with the California West team. The oversized residences at Southern Preserve, reflecting some of the largest homesites in all of Carlsbad, provide homeshoppers multiple floorplan layouts and elevation styles to select from. The limited, view-oriented homesites at Upper Cielo each reflect a unique and varying relationship to the land with mountain to ocean views. California West’s forty-nine personalized residences of Southern Preserve in La Costa, Carlsbad is now offering a limited collection of homes overlooking the rolling hills of Olivenhain and bordering acres of a natural preserve and open space. A new phase release of homes is now available for purchase. Highlights include oversized backyards on select homesites, and an ultra-private location set apart from neighboring residences. Featured this week is a Plan 2AR residence located on Homesite 20. Priced at $1,335,900 and offering 3,907 square feet of living space, this residence includes upgrades throughout the kitchen and master bedroom. The homes at Southern Preserve, La Costa showcase up to 6 bedrooms, 6.5 baths and are priced from the low $1 millions. Each floorplan offers a covered outdoor living area and large, free flowing kitchen space. Families at Southern Preserve will appreciate access to the coveted, award-winning schools in the Encinitas Union School District and San Dieguito School District. To learn more, see maps to the models, and register for future community updates, please visit: www.SPLaCosta.com. Or call (760) 652-5426 and learn more about the pre-qualification process. California West presents Upper Cielo, forty-one custom inspired residences at the top of CIELO. The gated community of CIELO is an exclusive community of spectacular luxury homes and custom homesites which occupies one of the highest vantage points along the San Diego coast, providing an unprecedented portal to sweeping views that stretch from the Coronado Islands and La Jolla to Lake Hodges and the coastal mountains. Several move-in ready homes are currently available for purchase. Featured this week is Homesite 73 which provides a very private cul de sac location, covered outdoor living space, front yard landscaping and upgrades throughout approximately 4,579 square feet of living space. This home is listed for $1,733,843. Homes at Upper Cielo, Rancho Santa Fe showcase up to 5 bedrooms, 5.5 baths with pricing starting in the high $1.2 millions. Optional living spaces are available, including a second master bedroom and observation deck. Residents have access to private, recreational amenities, including a community pool and spa, two tennis courts, a fitness center, and much more. Upper Cielo is now open daily. For more information, call 858.756.4572 or visit www.UpperCielo.com. We are not one of California’s largest homebuilders. We are a small, thoughtful builder. We didn’t set out to build hundreds of homes. We set out to build yours.